In this age of startups, tech companies and remote work, more and more jobs have been created. In fact, a number of these are jobs that were not even known 10 or 20 years ago. In our below Infographic we are comparing average salaries of Graphic Designer, Web Designer, Sr. Web Designer, Software Developer, Web Developer, Sr. Web Developer working in Canada, India, UK, USA, Australia, Philippines, Malaysia, Germany, Ireland, Italy, Netherlands, New Zealand, Spain, Belgium, Denmark, Hong Kong, Argentina, Japan, South Africa, Pakistan etc. We are talking about jobs like programming, web development and web designing. These kind of roles came about as a response to the ever changing and rapidly growing industry of technology and the Internet. We cannot deny the growing importance of these IT jobs in today’s economy. 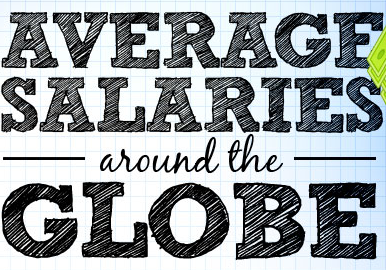 This is why for this Infographic brought to us by TimeDoctor.com, we will be comparing the salaries of designers and developers around the world. There is obviously a striking difference in their salaries. For instance, web developers in Denmark are paid three times as much as those who are in Hong Kong. Senior web designers in Australia and Ireland are paid really high while those in India and the Philippines get by with less than 20,000 US dollars a year. We also see that in some countries, web developers get paid way more than the designers. If you are an employer, this information could be valuable especially when you use it with your decision on where to hire people from. As a developer and designer on the other hand, this could give you an idea how other people in your industry are getting paid. Salary data has been generated from PayScale.com. Are you a programmer, developer or a designer? Are you paid well in the current location you are in? What do you think of the industry in general? Let us know in the comments.